1928 Austin 12 Clifton sold for £273 9s 9d. Homepage. This page: Two ladies in Croydon buy a brand new Austin 12 tourer in March, 1928. A new Austin bought from Moore's Presto Motor Works. March 23rd 1928 was no doubt an exciting day for Misses E.A. Brett and H.F. Streeter, as that was the day they purchased a brand new Austin 12 Clifton car from their local motor agent. 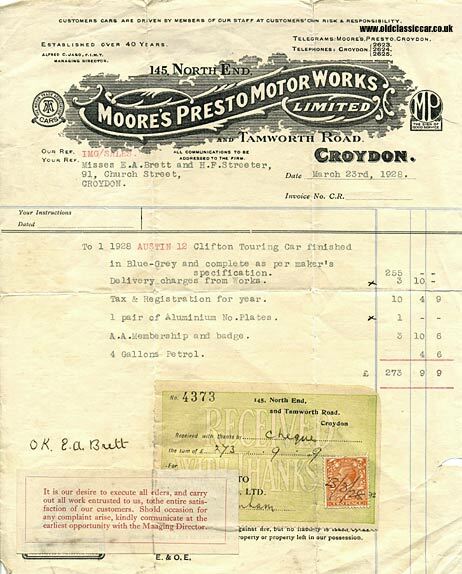 Moore's Presto Motor Works Ltd had two premises in Croydon, one at 145 North End, the other on Tamworth Road. This illustrated invoice, describing the sale of the new Austin, also confirms that the business had been in existence for over 40 years by this time. Maybe Moore's started out selling bicycles, or perhaps horse-drawn carts, before switching to the sale of horse-less carriages early in the 20th Century? The Austin 12 Clifton Touring Car, finished in blue and grey, was listed at £255, plus and extra £3 10s for delivery to the dealership from the Austin works at Longbridge. One year's tax and registration added £10 4s 9d to the bill, and a pair of registration plates a further £1. AA membership cost £3 10s 6d, and four gallons of petrol an extra 4s 6d. More items of motoring paperwork relating to vintage cars and garages can be found in the Motoring Collectables section of oldclassiccar.co.uk. Parts adverts for the 12hp Austin can be found here.